Heya folks. I’m currently waiting on a flight, so have a post! 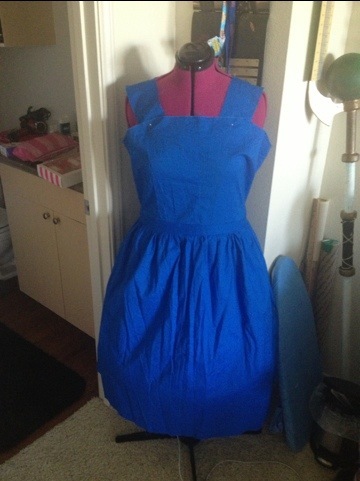 I made some more progress on my Belle dress last night. After much wailing and gnashing of teeth, I think it’s finally starting to come together. I have it pictured here with a petticoat underneath. So a little background: I decided to make Belle’s blue village dress as my Halloween work costume a few weeks ago, thinking that since I’d already made a Cambie, that it’d be just a few hours to whip up a pretty and quick comfy costume. Ha. Not. Getting started was pretty straightforward, but still required a few modifications. I took the bodice front from the Cambie and adapted it to a straight neckline. Then, I harvested the back from Simplicity 2813 and made a simple square strap to finish the bodice. I decided initially that I wanted to do a side zip, so I made that modification. I had also planned to make the skirt a full circle skirt that fell just below my knees (hahahahahhahahahahahaha). Cutting is where my problems began. As soon as I started cutting, I realized I had way too little fabric to do all that I wanted, especially that giant circle skirt. No big deal, I’ll just make a gathered skirt instead. I didn’t have enough fabric to do the full front and back pieces, so I just modified the back pieces to accommodate. I also wasn’t fond of my zipper color, but I figured that it was an invisible zipper and at the side, so no one would really see it. Trying the dress on was a real buzz kill. Nowhere near enough volume and the side zip felt like a giant neon light saying, “LOOK AT THIS PIECE OF CRAP.” I was also having trouble with the top, so I decided to set the project to the scrap bin and try later. While on a fabric store run about 2 weeks ago, I found the exact same fabric! Huzzah! I double checked my measurements before I left the store this time, and set about remaking the dress after much seam ripping. I still made a couple errors that I’m okay living with. I didn’t have a long enough strip for the waistband to be one piece, so I cut it into sections. That’s okay, since the waist will be covered by the apron anyway. I also didn’t mark my waistband with the seams for the skirt, so there’s more gathers in the back than the front. I think that actually works out pretty well, since it means my inseam pockets won’t be buried by the apron and there will be slightly less volume in the front. Hindsight is 20/20. All of this happened in about three hours last night. It definitely needs a wash and a good ironing after everything is finished, but I’m already much happier with it. Let’s hope inserting the lining and remaking the top go just as well!